In today’s age when most entrepreneurial journeys are marked with effective use of technology to find a solution to a challenge or make life easier, so agriculture can also be one of areas where technology can be applied to make lives of our farmers better. However, the Indian agriculture conundrum is very unique. And when it comes to technology in the agriculture sector, it is time to unleash its power to address the big beast in the room- Finance! Several reports looking at improving the agriculture sector focuses on increasing productivity by using modern technology, better seed inputs, better types of equipment, access to information be it on irrigation or weather and better access to markets. All this comes at a cost! And unless small farm holders have access to capital, these reports will continue to look good only on paper. Additionally, if some reports do focus on finance- it is more often than restricted to ease in the transaction and mobile banking convenience. But for solving the debt crisis of the agricultural sector with the use of technology, it has to go beyond banking services and bring more unbanked farmers into banking umbrella, to assist financial institutions in making decisions backed with data and enabling them to monitor and collaborate with farm holders for better productivity. In the last 50 years, Indian farmer ’s size of holding has reduced drastically. 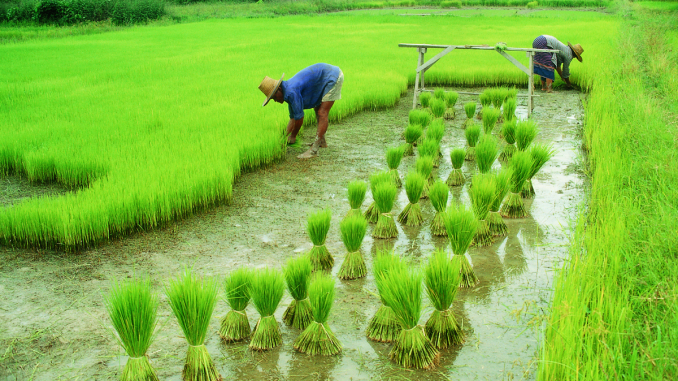 Approximately 67% percent of farmers hold less than 1 hectare of land. Incomes have shrunk, and their creditworthiness has come under question. According to India Spend, a data-driven journalism portal, nearly 70% of India’s 90 million agricultural households spend more than they earn on average each month, pushing them towards debt, which is now the primary reason in more than half of all suicides by farmers nationwide. This despite the fact that, time and again governments resort to writing off loans. Last year Uttar Pradesh and Maharashtra wrote off loans over Rs 60,000 cr loans, and India faced a cumulative loan waiver of Rs 3.1 lakh crore or 2.6% of GDP in 2016-17. Further this year in the annual budget, the government once again laid down a slew of measures to support agriculture sector Apart from raising the minimum support price for all crops, the government proposed raising credit for the agricultural sector to 11 trillion rupees ($172.3 billion) for the upcoming fiscal year. While agriculture loans could constitute a significant portfolio for lenders, they attach high risk to it. -It is hard to establish land holdings of small farm holders, which is often needed as collateral for traditional agriculture loans. It is hard to access farm activity in remote areas, making it a time-consuming and costly task. The land titles, history, and rights are still undergoing through a digital transition in India and more so in remote areas. Land records are often subject to legal ownership disputes and have not kept pace with rest of the technological advancements. Some of the land records are as old as 100 years and does not have coordinates to locate the farms on modern digital maps. While GPS enabled devices equipped with custom Loan Origination System (LOS) can allow capturing farm boundary at the time of filling loan application at the site, artificial intelligence combined with Natural Language Processing (NLP) is enabling systems to be much smarter and easier to use for agri-lenders. These technologies combined is already helping lenders scale much more efficiently when dealing with large untapped markets with farmers working in remote areas. The big gap remains in bringing unbanked small farmers to the banking sector, and how to give banks/financial institutions the comfort of lending without the fear of delinquencies. This can only happen when banks are empowered with the tools to make informed decisions with actionable data before them. Satellite imaging data and machine learning can be used to fill much-needed data gaps for assessing farmers production ability and to monitor progress. Remote sensing tools can be used to assess historical yields, identify crops planted on different parcels, water levels to determine irrigation, soil quality etc. All this information clubbed with machine learnings can further estimate time of harvest, approximate income and predict the likelihood of default in advance. Remote sensing tools, AI, and machine learning can not only enable a better understanding of repayment capacity of a farmer but can empower financial institutions to check land boundaries and monitor crop production on their desktop without undertaking a physical inspection. It can, therefore, reduce cost, turnaround time of loan application and improve the agriculture lending portfolio. The satellite imaging also can work effectively to provide early warning signals for any factor that could impact the crops and thereby repayment of the loan. Globally the developed markets are embracing precision agriculture as the future of feeding. Using the same technology for better assessment of crop and improve production with substantial data inputs. For India, this future comes at a cost. And therefore if these very technologies that bring precision agriculture to reality are used first for bringing finance to farmers, would we be able to come close to the vision of doubling farmers income in India.